How do your fees compare? NSA conducts a periodic survey of members to gauge the average cost of preparing many types of tax returns. 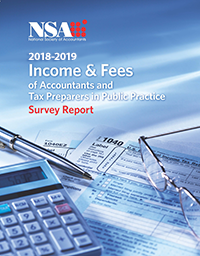 NSA's Income & Fees Survey contains detailed information on fees charged for tax preparation and accounting services, broken down by state, geographic region and practice size. Operating expenses broken down by category are included in addition to information on billing practices, succession planning and other business practices. National, regional, and state average fees for federal tax returns by form and by schedule along with average minimum and hourly fees. National, regional, and state average hourly fees and fixed monthly fees for write-up work and additional client services such as payroll, etc. Additional fee averages for IRS representation, expediting returns, extensions, etc. Average frequency of tax and accounting fee increases & office billing practices. Practice management data including average operating expenses, marketing, technology, practice mix and more. The National Society of Accountants is the only national association serving the needs of "Main Street" tax and accounting professionals. NSA members receive a wealth of benefits to help save time and increase profitability including the complete Income and Fees Survey and tax research. The 2018-2019 NSA Income & Fees Survey is s available for sale as a PDF download for nonmembers. Join NSA and get your free Income & Fee Survey download.